There was an article in the Sunday New York Times entitled, The Problem with Positive Thinking. It states that the problem with positive thinking is that it fools the mind into perceiving that we’ve already attained our goal, and weakens our ability to go out and achieve it. Actually, this sounds more like negative advice, keeping people feeling down and defeated. Every theologian, philosopher, and great thinker have disagreed on many topics, however they all agreed on one. You become what you think about. If your thinking in negative terms, you will get negative results. If you think in positive ones, you will get positive results. In a world where we are bombarded with negative messages all day long, I believe we need to hear, see, and feel positive and uplifting affirmations to help us change our own thinking and heal the world. Yes, you need to set goals, and take action, not merely day dream about something you desire. The article says that positive thinking may calm you down but drains you of energy. I know that when I think positive thoughts, I feel energized and when I am feeling negative, I feel down and have little energy.. The study they conducted to prove their theory, is just that, a theory. I suggested you take the advice of people who are positive minded, associate with positive thinkers and fake it until you make it. After all, if you think you can, you are right. 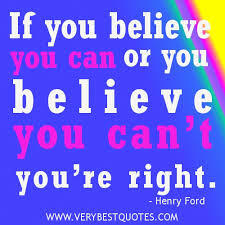 If you think you can’t you are right too! This entry was posted on Tuesday, October 28th, 2014 at 12:32 pm and is filed under Art of Thinking. You can follow any responses to this entry through the RSS 2.0 feed. You can leave a response, or trackback from your own site.